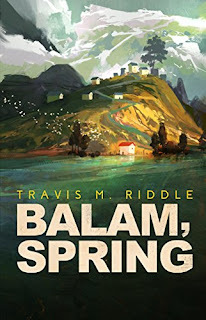 So Balam, Spring was another book kindly sent to me by the author via TBRindr. While I'd not come across the title before, I liked the premise and thought that the whole Midsomer Murders meets Harvest Moon vibe that it promised had a lot of fun potential. Balam, Spring focuses on the isolated coastal town of Balam, just as they enter spring. What is normally a joyous time of year when school is out and the landscape starts coming into bloom turns sour when the town's assigned white mage dies suddenly and mysteriously. A new white mage, Aava, is called in to replace her, but it soon becomes clear that other people have the same symptoms and that the town could be in grave danger. 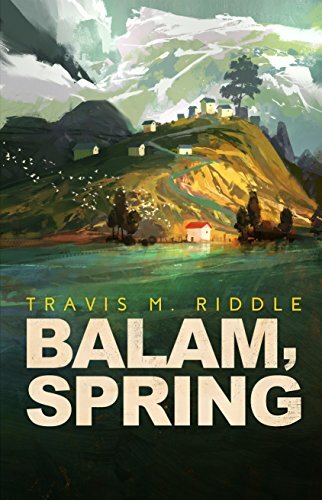 I feel somewhat conflicted by Balam, Spring. I'll start with the good parts of it. The actual mystery is well-constructed and has a decent amount of twists. The characters are engaging and varied, from Aava, the new white mage trying to prove her skills in a bleak situation, to Ryckert, a retired mercenary lured out by the promise of adventure, and Theo, a local schoolteacher who witnessed the original death and was wholly unprepared for the reminders it gave him of his tragic childhood. Overall, there was a lot to enjoy, and I would probably give it a recommendation to those who don't mind a book that needs a bit of fine-tuning. That leads me to the parts that I had issue with, which is a bit of inconsistency with the writing and world-building. Nothing major that ruined the book for me, but noticeable enough to become niggling. The trouble seems to be that, depending on the subject, the book will furnish either too much information, or not enough. For too much information, the first thing that springs to mind is the descriptions of food and general routine, as while the sections aren't written badly, it's the sort of detail that doesn't add anything meaningful to a scene. I don't need to know the exact dishes that a couple are enjoying at their meal out, I just need to know that the food enhanced the good mood that they already had together, otherwise it becomes kind of distracting and makes me wish I had more time during my lunch break. And with regards to too little information, I point you towards the non-human races introduced, the Jeornish and the Rocyan. The former have white hair and the latter have fur. That was about all that the narrative furnishes the reader with before it continues on its romp, and that really bugged me. If the non-human races had been elves and dwarves, then I could understand not elaborating on their racial features, because they're common enough to not need explanation. With races that Riddle has presumably made wholesale, it is unsatisfying to finish the book with no real clear idea of what they even look like. It's like showing a blind person a poster and expecting them to understand the significance without explanation. As I said though, the actual meat of the narrative is enough to make this a minor problem, but I did finish Balam, Spring thinking that it could have benefited from another round of editing.